I have been learning to use Fireworks to edit images, so here is an initial crappy example of what I have learned. I guess it will take a lot of practice before I can produce a decent piece. As I already mentioned, the result is crappy, but I will continue experimenting. My goal is being able to recolor scenes from old comics to post in the blog; it bugs me having to post images where the colors are so pale and old you can barely distinguish anything. There are lots of material from the 60's and 70's featuring the redheads that I am eager to post here. Mera met the Wonder Twins for the first time during a Crisis in Atlantis. 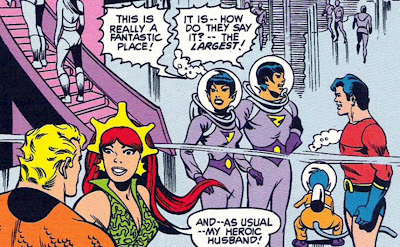 After Aquaman and the Super Friends saved the day, Aqualad and Mera gave Zan and Jayna a tour of the submarine city. During another crisis, an enemy was able to brainwash the Super Friends, and turned Aquaman into a villain. 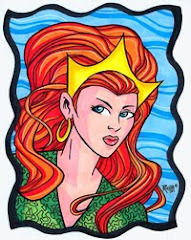 Wonder Woman was able to contact Mera telepathically, and the Queen of Atlantis was able to stop Aquaman's rampage using her hard-water powers. 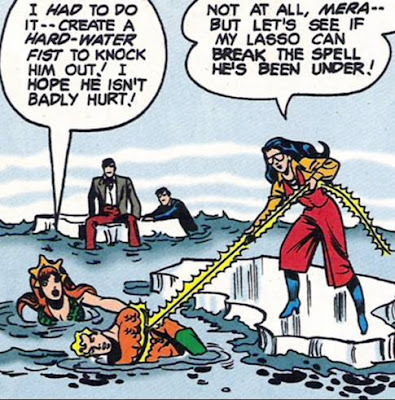 Then Diana Prince used the lasso of truth on the King of the seas to break the spell he was under. 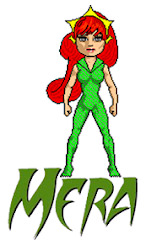 It was Mera's timely intervention that saved the heroes from impending disaster. 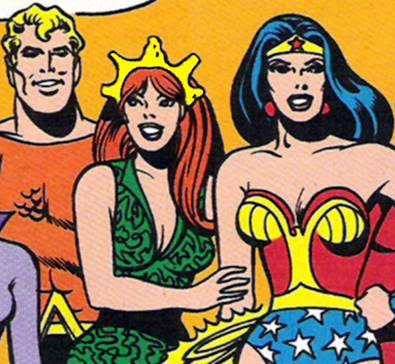 Here, Superman gives Mera kudos for her assistance, and the Super Friends celebrate one more victory. By the time the Wonder Twins Zan and Jayna arrived from Exor, the ranks of the Justice League had just been increased with the addition of Red Tornado and Hawkgirl. All the members of the League were debriefing on their most recent mission (circa JLoA 148) when the twins arrived with the warning of an imminent menace. In a mission that took them around the world, the Super Friends banded with heroes from around the world to fight an alien menace. Hawkman and Hawkgirl joined forces with Owlwoman, a native american that had the ability to channel the powers of her ancestors. She was the obvious choice to pair up with the Hawks since they have a similar modus operandi. Now, for clarification purposes, all the members of the Justice League (except J'onn J'onnz and the Phantom Stranger), up to and including Hawkgirl, were members of the comic book Super Friends Team (Zatanna was never a member, and Firestorm was part of the Super Powers Team). In addition, the Super Friends also included Robin, Zan, Jayna, and graduates Marvin and Wendy. Hawkgirl :: What Am I Doing Here? Roy Raymond was the host of a television show, called "Impossible... But True! ", which bore a strong resemblance to "Ripley's Believe It Or Not". Raymond was also a formidable detective and there was no mystery that could escape him. And such was the case when his coworkers prepared a prank for his anniversary at the TV Station. They contracted a group of actors to pose as Aliens for Roy's show, but he was able to discover the ruse and turned the joke around by bringing a real alien... one from the planet Thanagar: Hawkgirl! 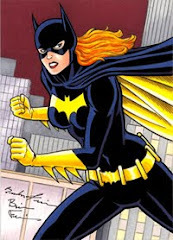 Batgirl :: What Am I Doing Here? In a Green Arrow backup story of World's Finest #255, Clark Kent is covering the elections for Mayor in Star City. One of the candidates is Green Arrow himself, or rather, his secret identity Olliver Queen. And who does Ollie get to back him up and endorse him during the campaign? His colleagues in the super hero community; here we have the exiting mayor of Star city accompanied by Supergirl, Aquaman, Wonder Woman, Atom, Black Canary, Flash, Robin, and Batgirl. 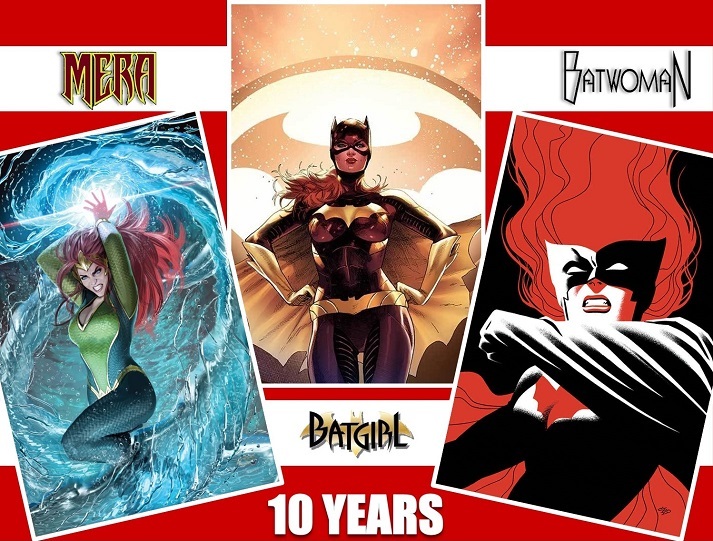 Now, Batgirl and Supergirl are not good enough to be part of the Justice League, but they are good enough to ask for their collaboration in these events? That's not fair! Don't you hate it when your co-workers come to sell you those girl scout cookies, and tupperware, and tickets for raffles to help their children's schools? I can't imagine these heroes not rolling their eyes when Green Arrow asked them to participate in this little rally. Poor Batgirl... how cheap she must feel! Mera :: What Am I Doing Here? Not long ago we saw the cover of Justice League of America #88 which included guest star Mera. Well, back then it was mentioned that she did not play a significant role in the story, but today I just want to show how non-significant it was. 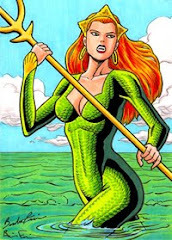 In panel number one Mera is acknowledged by Green Lantern as she and Aquaman arrive to the island where the story starts. In panel number two she and GL look very concerned. In panel number three, she is told by Aquaman to go back to Atlantis and ensure that everything is in order in the underwater city. 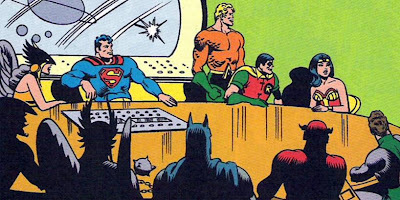 In panel number four, for some reason she reconvenes with the rest of the League members after the threat has passed, and finally in panel number five she and her husband dive into the ocean after the meeting is adjourned. She did not say one word, and her most significant action was looking concerned in panel two. What was the point of having her in this story? July 20th 2006 was a very special day for fans of the DC Universe. The United States Postal Service released its stamp collection honoring the DC heroes. As part of this historic moment, a myriad of different products were also launched to commemorate the event. One of such products was this envelope showcasing the Super Friends. Superman, Batman, Wonder Woman, Flash, Supergirl, Green Arrow, Plastic Man, Starfire, Firestorm, Hawkman, Shazam, and Mary Marvel are featured in this beautiful envelope designed by PhotoFile. 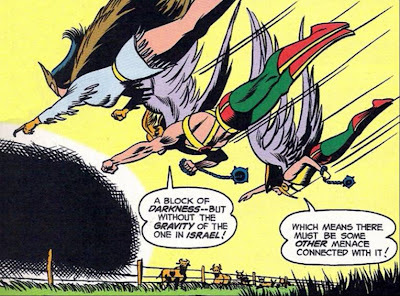 Hawkgirl is also featured along with Green Lantern and Captain Marvel Jr. while Batgirl is seen running alongside Aquaman and Robin's crotch. 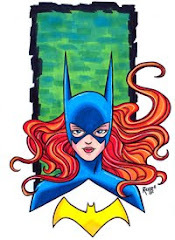 Art by José Luis Garcia-Lopez. I own this pretty little piece and I love it; it is from the first day of issue in the San Diego ComiCon. "This was always an issue we were going to have to deal with," Geoff Johns said during an interview back in 2003 about the three part arc that ran in issues 15-17 of the Hawkman comic. "It's a Hawkman book and there's still the Hawkworld Hawkwoman out there. Of course, it was intimidating in the fact that we really felt we had established who the Hawks were and we had lots of new Hawkman fans reading the book. 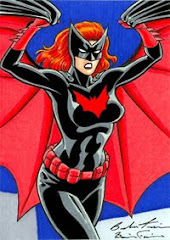 It all comes to down to this - I think there's a really fantastic story involving her return to the DCU." "It may have been easier to avoid confusion, but I think to some extent a lot of questions are still being raised with readers. We thought it best to literally layout a simple timeline and tackle the issue head on. Michael Watson had drawn an absolutely stunning Hawkwoman [cover] and I guarantee any fan will be knocked out. Shayera has never looked this good." A sighting of three mysterious characters in cowls has been reported. These three costume-wearing vigilantes are members of the reknown Super Friends. 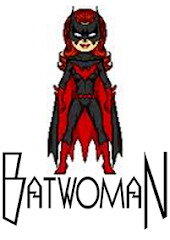 Two of them wearing capes and merging themselves with the shadows, certainly lead to conclude they are Batman and Batgirl from Gotham City; while the third figure flying through the air can only be the winged wonder from Midway City, Hawkwoman. 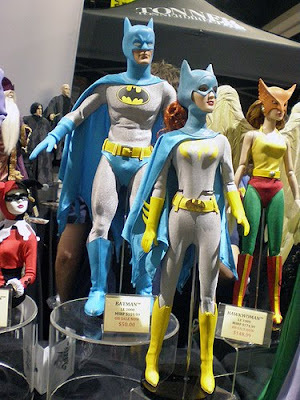 This exciting pic is from an exhibition showcasing Batman, Batgirl, and Hawkwoman by Tonner Doll Company. And of course, notice the crazy Harley Queen maliciously spying on the heroes. What a groupshot! 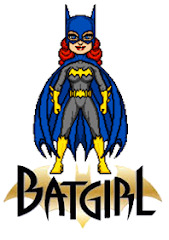 Ramona Fradon started her comics career in 1950. She got a job at DC Comics, drawing 'Aquaman', and co-created the character Metamorpho. 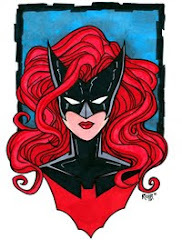 She also worked on DC titles such as 'Superman', 'Batman', 'Super Friends', and 'Plastic Man'. Today, we continue the Ramona Fradon series revisiting a pin-up of Batgirl presented previously, plus new art in color and pencils. Enjoy. Mera, Flash, Firestorm, and Atom have been left by themselves to fight the menace of Black Lanterns J'onn J'onnz, Firestorm, Hawkman, and Hawkgirl. Firestorm Ron Raymond takes the lead against the heroes and splits Firestorm Jason Rusch and Gehenna. When Jason merges with his Black Lantern counterpart to stop him from hurting Gehenna, he has visions of events taking place in other corners of the universe: He sees Dawn Granger Dove fighting against Hank Hall Hawk, the Sinestro Corps in battle with the Qward Thunderers; he sees the desacrated grave of The Question, as well as Black Hand, the Guardian Scar, Ragman, a scythe-lantern, and Mera impaling Hawkgirl. Even after merging with Ron, Jason is unable to stop him from converting Gehenna into salt and ripping her heart out. Jason's emotions are at a peak, which is exactly what Mera had warned him about, and in doing so, the young man is increasing the power levels of the Black Lanterns. A swarm of Black Rings enters the Hall of Justice and passes by the already overwhelmed Mera, Flash, and Atom to make its way to the bodies of dead enemies who come back to life: Alexander Luthor, Copperhead, Madame Rouge, Maxwell Lord, Doctor Light, Psychopyrate, Brainwave, and more! What are the heroes going to do? Green Lantern, Flash, and Atom are overwhelmed with the combined menace of six Black Lanterns, who are not just living dead, but also powerful former friends and teammates. When Black Lantern Sue Dibny is about to rip out the Atom's heart, the Indigo-1 Lantern appears and saves the heroes. Indigo-1 is able to sever the Dibnys' connection to the black battery and vanishes them; then teleports herself, her companion, and the three heroes away. Back at the Hall of Justice, Mera is talking to Firestorm when Green Lantern and his companions materialize. Flash recognizes her and asks her whether she is alright. She tells the group what happened to Tempest, and then along with the other heroes question Indigo-1. The Indigo Lantern talks about the origin of the universe and how darkness was overcome by light at the beginning, but then started to fight back and splintered it into the seven colors of the spectrum. Now darkness is attacking again and is trying to reclaim what once belonged only to it. At first the heroes believe that the Black Lanterns are not really their deseased friends, but after Mera explains that Aquaman knew everything Arthur Curry did, the Atom concludes that perhaps the rings took over the dead to attack the living under some kind of programming. Indigo-1 advises that representatives of all the seven corps must come together to replicate the original white light and defeat the Black Lanterns. When Green Lantern makes a dismissive comment about Death, Flash lectures him on how insensitive he is being to Mera and Atom's recent ordeals. After a brief argument, both friends make amends and decide that it is time to fight back; but suddenly, the Black Lantern Justice League appears, and Indigo-1 and her companion take Green Lantern away leaving Firestorm, Atom, Flash, and Mera by themselves.